Experience Colour Everyday…. the Sun is Always Shining in My Studio! You are Invited to join this Colourful Adventure! 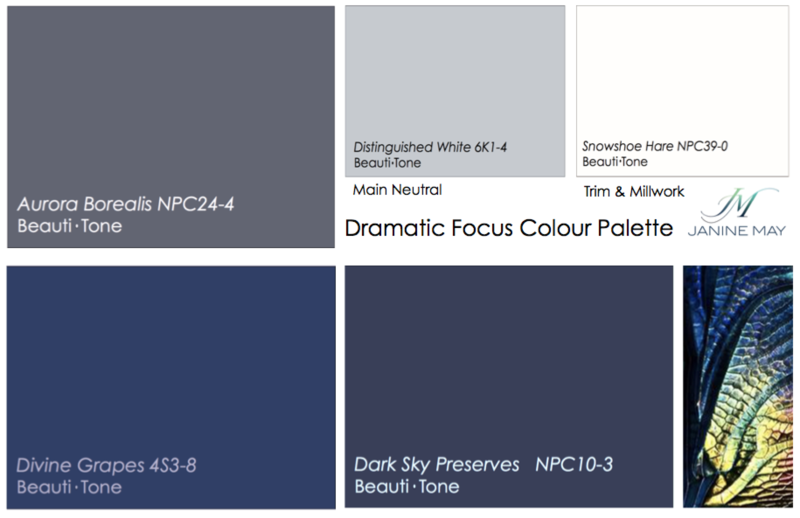 Purposefully discovering the pure essence of colour inspirations for design…. decor…. or wherever colour takes you! We discover colour in the world around us each day… it can be subtle or it can be dynamic. Colour is SUCH a powerful element to create with. We all experience colour uniquely, so be sure to enjoy the world in living colour! Yellow is full of Energy and Freshness! A burst of Sunshine, a ray of light or a hopeful yellow ribbon tied to a tree! Yellow is full of energy, vitality and a hit of freshness! A powerful burst of sunshine, a ray of light or a hopeful yellow ribbon tied to a tree! Yellow is said to stimulate intellect and creativity, filling your mind with positive energy. It is always seen as a happy colour!…remember, Smileys are yellow! George Harrison wrote the famed Beatles song “Here Comes the Sun” as a relief to the long grey winter, getting outside to finally enjoy some spring sunlight, from the dull winter 1969 England. What’s the sense of yellow anyway? Yellow in Nature: Bananas (a source of Vitamin D), canaries, honeybees, daffodils, buttercups, day lilies, lemons, etc. Scent: Citrus, uplifting, zippy, fresh. Taste: Straight lemons make your mouth pucker, but lemon tea is refreshing. Yellow in Design: Welcoming, warmth and cheery atmosphere is created. 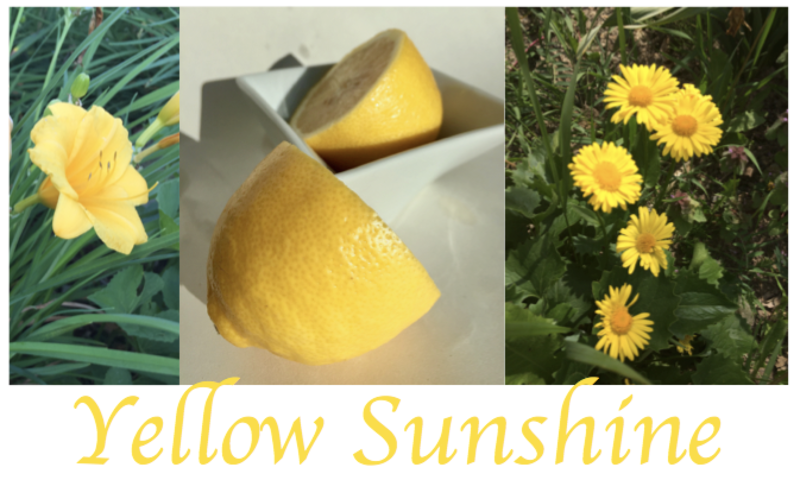 If someone is unwell, try bringing yellow into their space through flowers or accessories to lift the spirit and reflect light. Ding! 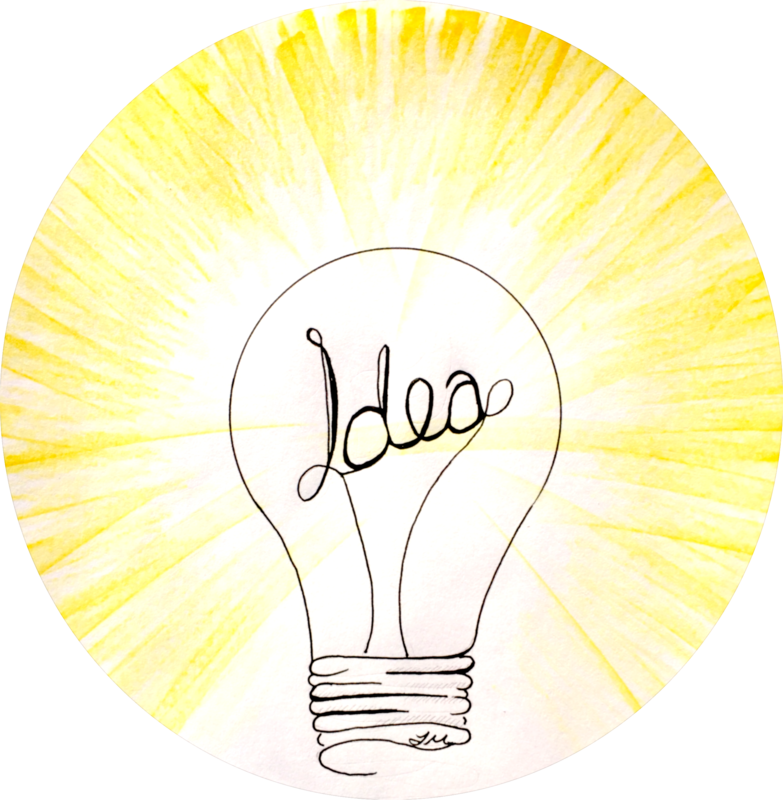 I have an Idea! Soft yellows (think butter) are stunning on walls in children’s rooms, just be sure to temper the shades, as saturated tones can create excitement making bedtimes a challenge! Bright pops of canary or sunshine yellow lend themselves well to modern design, whereas more toned ochre, gold or mustard are often seen in traditional or heritage designs. Yellow is the perfect antidote to a dull day—have yourself a sunshine of a day filled with bright ideas! Ever wish your office was in a Tree House? 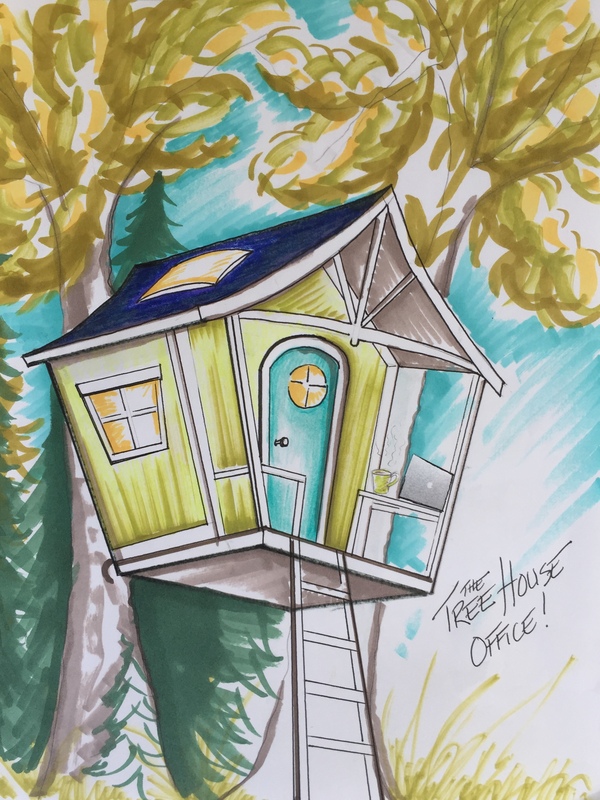 Inspired by Nature- My Tree House Office!! Well mine kind of is! Writing & creating in a space with lots of warm natural sunlight (Vitamin D), fresh air, & plant life is essential to my style! 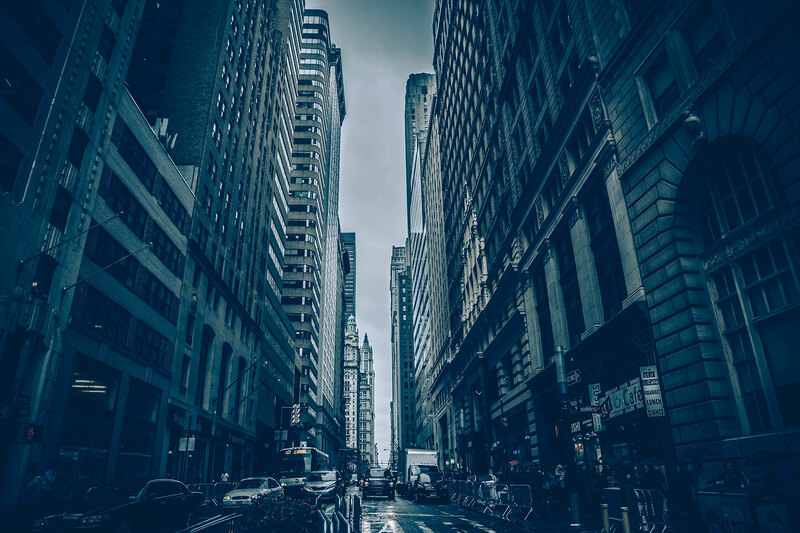 Not only your atmosphere becomes more organic, but so do your content and creative pieces! 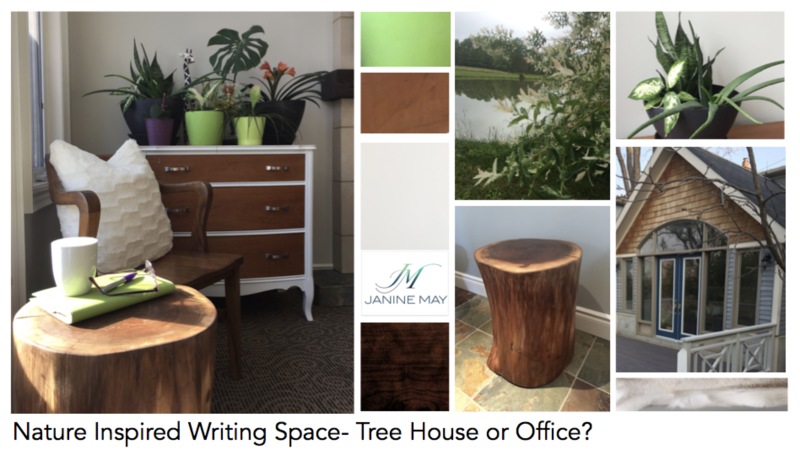 Colours, materials and finishes inspired by nature are almost essential to recreate this atmosphere if you cannot have your office in a Tree House! How do we Select Colours & Finishes to tell the story? 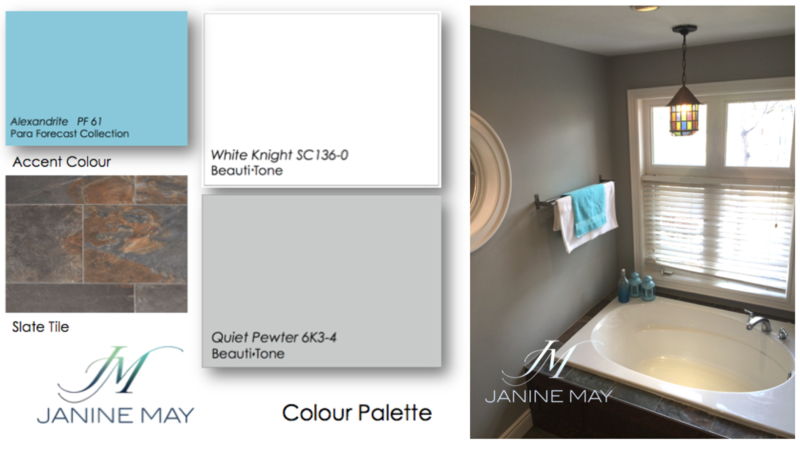 Colours & Finishes create our atmospheres, that we can feel thru nostalgia and our 5 senses. Some favourite wood finishes are oil on mahogany and/ or oil on walnut wood! Espresso colour reminds me of coffee in the morning when you are at your best! The walls appear as ‘carte blanche’ grey-ish white carrara marble inspired hue, which can seem like the blank page of an ancient hand made book waiting for history to unfold before us! Shades of white can clear your mind, having slight undertones (ex. warm or cool) can define architectural details in a space differently. The Fresh Exciting Modern Green infuses new signs of life, sprouting new leaves of inspiration! 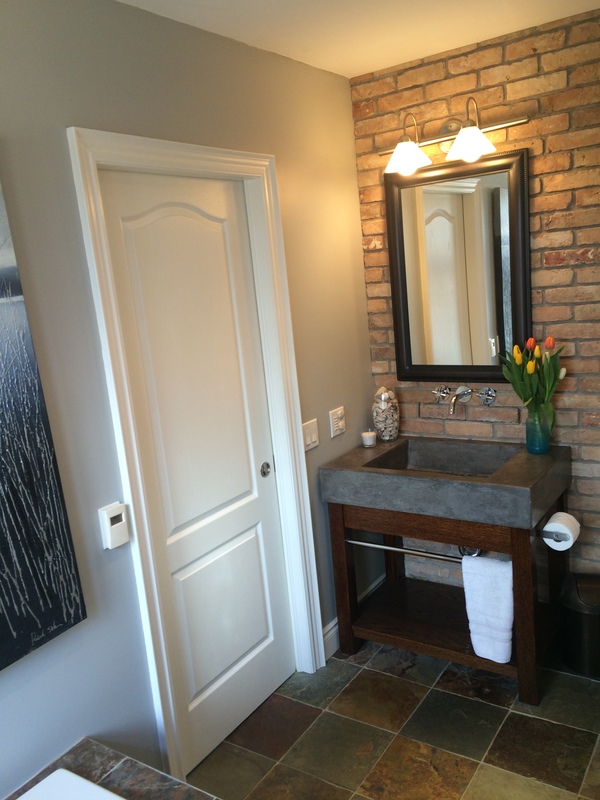 Creatively refreshed, inspired and energized this space makes anyone feel! Pull up a chair and create your perfect inspired space! Inspiration Design Board for Dining Space Colours & FinishesHow to Set the Stage for a Dining Space you ask? Drama- Is the name of the game for Dining Rooms for colour & lighting! Let’s take the Myth right out of; only pale shades on the walls make a space feel GRAND! Actually depending on your dining room space, this is the room where you can go a little wild with! Saturated deep hues add dramatic, elegant evening tones, which create visual focus in a well planned space. 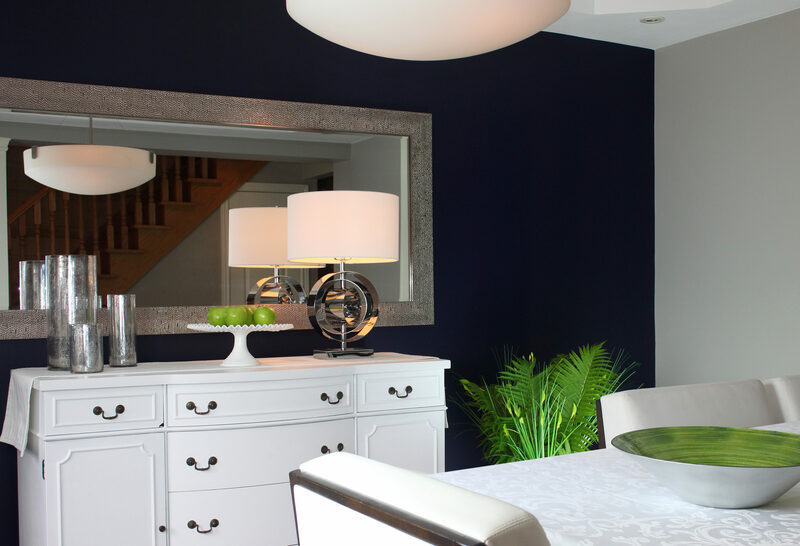 This dining room was colour balanced by adding a rich accent wall, layering contrasting finishes in furniture, metallic silver, pewter and don’t forget the mirror to further enhance depth and reflection of lighting! 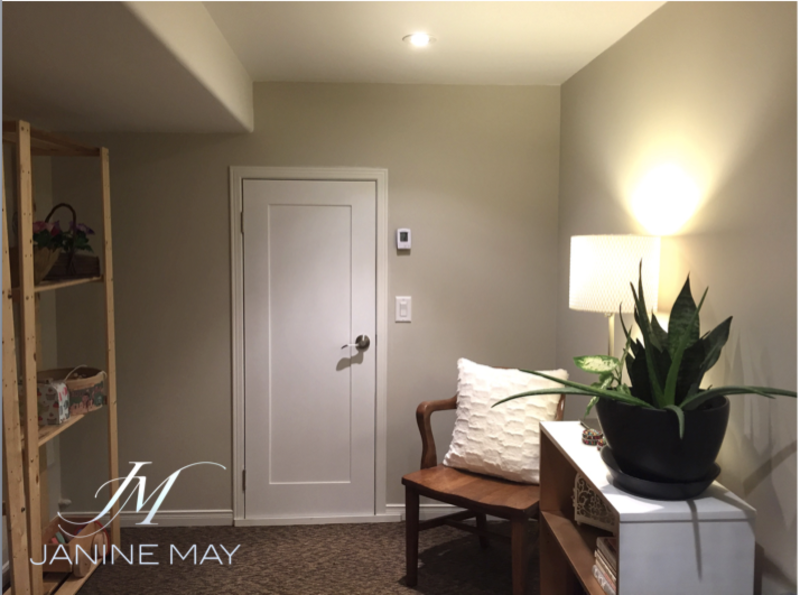 Lighting is a key component, layering lighting types and dimmers on your switch plate! – Your guests almost expect a little excitement here as your dining space sets the stage for a little entertainment! The Dining room Designer stage is set, your dinner party conversations will never be the same with these curated Designer Trade Secret Hues! Continuously, I am inspired by colour & finishes found in nature when designing spaces and this dining room is inspired by the illusiveness of the magical midnight sparkly sky, finishes of a dragonfly wing, crisp, fresh natural green fruit & foliage. One Dynamic deep tinted accent wall is all it takes to create this look, and when you bored of it- Change it up- it is only One Wall! Colour Inspiration is all around us, drink it in, snap a shot, experiment with it- ‘Colour is Pure Luxury! 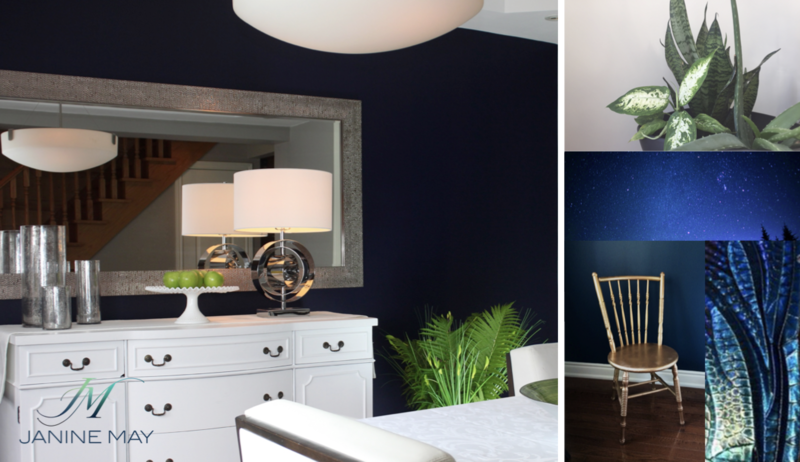 Modern Dining Space Inspired by the Magical Midnight Sky! Longing for Spring and the freshness it brings– I have a simple project for you! Just add a little seaside inspiration! transforms the space from boring to a little oasis infused with spring! The Colour Palette & Complete Picture! 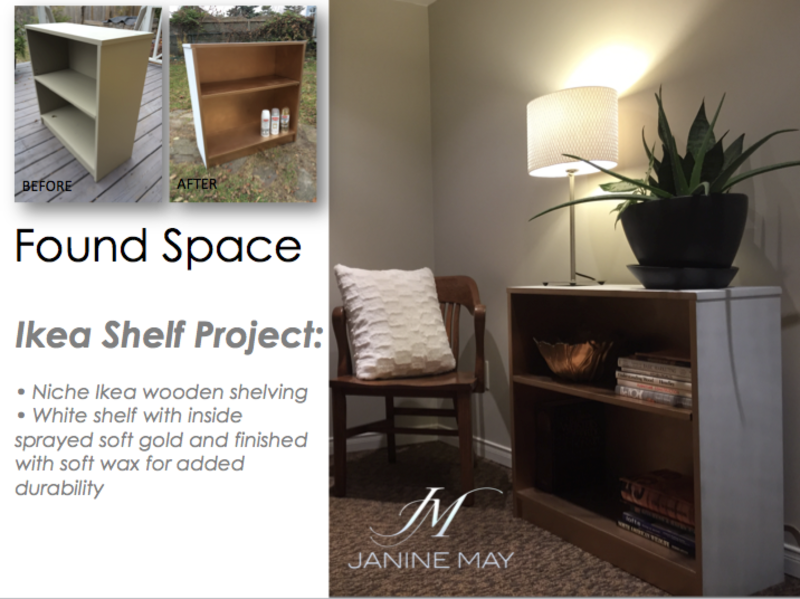 Ikea Shelf Hack- Before & After! In 2018, I find myself cleaning, purging, and minimizing items at home, and yet still finding I need proper storage space! Deep in a dark basement full of stuff, I took measurements, drew up a plan—as I am on a mission to find space—and did just that! After stripping some old paneling and framing in this basement, we uncovered an old cantina from the 1940’s hidden behind a wall. What a treasure! Yessss! We scored some awesome cold storage, since I don’t have a second refrigerator, and we love to entertain. 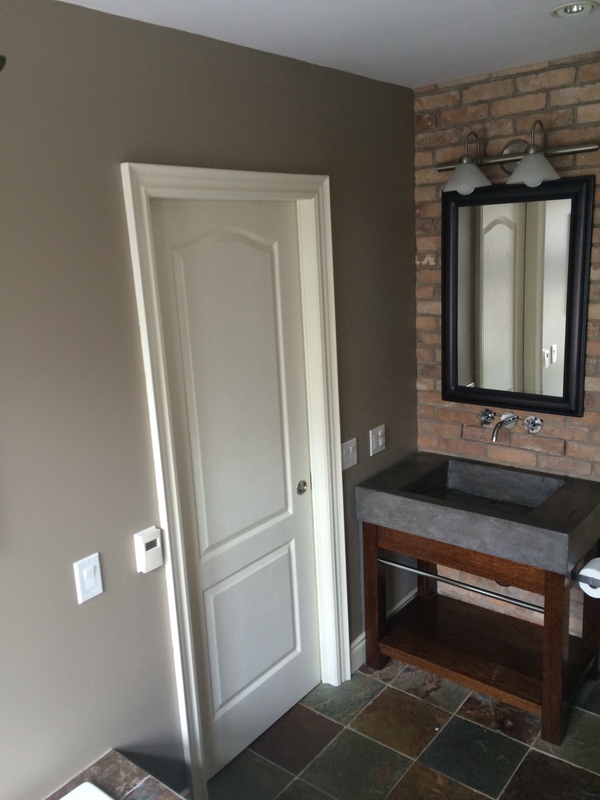 Here’s how we finished the project….